We’d love your help. Let us know what’s wrong with this preview of Trust by David Johnston. From our esteemed former Governor General--and author of the bestsellers The Idea of Canada and Ingenious--a very timely guide for restoring personal, community, and national trust. Trust is a much-needed manual for the repair and restoration of the social quality on which all democracies rely. One of Canada's most revered governors general, David Johnston mines his long li From our esteemed former Governor General--and author of the bestsellers The Idea of Canada and Ingenious--a very timely guide for restoring personal, community, and national trust. Trust is a much-needed manual for the repair and restoration of the social quality on which all democracies rely. 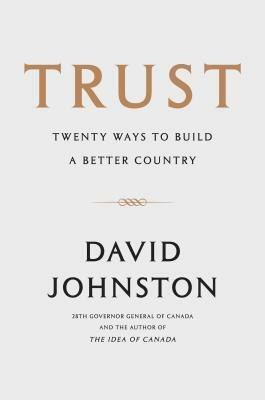 One of Canada's most revered governors general, David Johnston mines his long life and varied career to give Canadians twenty ways to make themselves, their institutions, and their country more worthy of trust. Many of these habits, attitudes, and approaches stem from his experiences serving as the representative of the head of state in Canada for seven years. Some ways are individual--listen first, never manipulate, be consistent in public and private. Some are geared toward leaders at all levels and of all stripes--be barn-raisers, tell everyone your plans, depend on those around you. And some are societal--apologize, cherish teachers, invite others to dance. To ask other readers questions about Trust, please sign up. If you're looking for statesmen today, take a look at David Johnston, the former Governor-General of Canada. In his third book he shares a few lessons from his own life, shining as a humble servant to his country, for building trust. Whether you're on a small team, a corporate leader, or entrusted with maintaining the civic life of a nation, this manual has lessons for you. Such a lucid, wise and inspiring book! Already proud to be a Canadian, I found this book to be both affirming and challenging, as our former Governor General lays out his belief in the importance of building and and maintaining trust as the keystone of what makes Canada great -- still. Excellent. Great book for leaders to read. David Johnston was beloved as our Governor General, and you can see why as he lays out many of the lessons he has learnt over the years, in how to manage, treat people, and lead in a society that is increasingly cynical. Great insight from a statesman who has a wealth of experience and a breadth of knowledge. I grew in appreciation of who David Johnston is, the important role the governor general plays and most importantly the role each of us can play in becoming trustworthy for the sake of improving Canada. Several nice nuggets of wisdom from a man with a lot of expertise and experience.